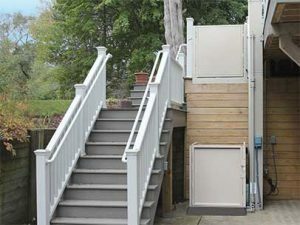 For wheelchair users the installment of a vertical platform lift (VPL) at their home or office can mean greater independence and a higher quality of life, since they facilitate access to raised porches, decks and such through a seamless vertical transportation. Orthopedic Service Company handles the installment of vertical platform lifts in Cary, NC. We currently work with Bruno and Harmar, two of the top brands in the market in order to offer the best possible mobility solutions for you. Vertical platform lifts are a great alternative to ramps in both commercial and residential buildings. This mobility solution handles the transport of a wheelchair or scooter in an elevator-like manner, offering a wide range of lifting heights, going from a few inches to 14 feet. Bruno and Harmar, the brands we work with at Orthopedic Service Company, guarantee the success of our service each being built with the highest quality in mind, uniting a unique set of features meant to fulfill each customer’s specific needs while meeting National Accessibility Guidelines and being ADA compliant. Contact our team of professionals for everything regarding the purchase and installment of a vertical platform lift in Cary, North Carolina.